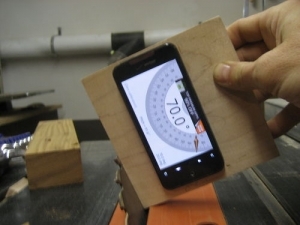 Homemade electronic bevel gauge consisting of a smartphone running the 'Smart Protractor' app attached via double-sided tape to a squared section of plywood. Plenty of free apps already that are decent substitutes for relatively expensive angle finders and bubble levels. Those platforms aren't as oil- or water-resistant though. Expanding the use of smartphones. Very clever.